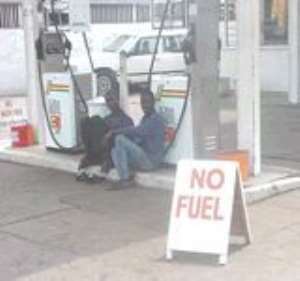 Accra, Feb 14 -- In what looks like the result of panic buying and hoarding ahead of expected price hikes of petroleum products, some fuel stations in Accra and are reporting a shortage of the products. Speculations have been rife in the media about an impending increase in the prices of petroleum products in the face of a deregulated petroleum sector. Government had set in motion the process of disassociating itself from the business of importing and refining crude oil and the fixing the prices of petroleum products. This would mean the current subsidy of about ¢200 million monthly being enjoyed by the sector would be withdrawn hence the expectations of a price hike. However it is now clear that the process of deregulation would not be complete by tomorrow's deadline deepening uncertainties as to when any price adjustments would be announced. The situation is worsened by suggestions in the media that petrol prices would increase from between ¢30 thousand to ¢40 thousand Dealers and patrons of petrol have reacted very quickly to this situation and are either hoarding or panic buying. The result has been an artificial shortage of the product at a number of fuel stations even though checks by JOY Business Report indicate that TOR has increased the amount of fuel to the market. It is not clear how long this situation will persist since it is remains uncertain when any price adjustments would be announced. Sources indicate to JOY Business Report that government might announce a withdrawal of fuel subsidies to coincide with its budget presentation next week. The move, which would fulfill government's pledge to the IMF, would then pave the way for petroleum price hikes ahead of full deregulation. Panic Buying Responsible For Fuel Shortage-TOR The Tema Oil Refinery (TOR) has dismissed suggestions that inadequate oil supply is responsible for the pockets of fuel shortages in the capital and parts of the Ashanti Region. Since last Thursday, motorists seeking to fill their tanks have been turned away, for what Oil Marketing Companies (OMCs) describe as a shortage within the system. However, officials of the refinery have said that this cannot be, because over the last three weeks more fuel has been pumped into the system than normally required. Nana Aba Lokko Public Affairs manager of TOR told Joy News that TOR is baffled by the shortages reported in the two major cities. According to Mrs. Lokko, TOR supplies fuel to the various OMCs based on demand. “ We are operating an open market system where our supply is determined by demand, so as and when the OMCs increase their demands for products we supply accordingly so the increase is due to the demand by the OMCs, we have not rationed any fuel any where” she said.